'KALIBR' is in Gauging business for almost two decades. With this experience, we can offer complete solution for all Gauging needs - Threads as well as for Plain Diameter. Apart from manufacturing gauges as per various International standards, our specialty is in designing solutions to fulfill specific gauging needs of our customers. KALIBR's Product Range covers almost all types of Thread & Plain Diameter gauges. 'KALIBR' has built manufacturing facilities of Global standards. 'KALIBR' has a well equipped calibration Laboratory. Kalibr Instrument Plant (Russian: ÞÓÈÇ «ÊÀËÈÁÐ») is a company based in Chelyabinsk, Russia. The Chelyabinsk Kalibr Instrument Plant produces universal and specialized calibrating instruments for use by industrial plants and defense facilities, and has produced ordnance measuring devices for missile artillery organizations. The Kalibr plant is attempting to develop markets for its products in developing countries. 'KALIBR', the name synonymous with Quality Gauges was established in 2000. During this journey, with continuous modernisation, we have built manufacturing and calibration facilities of global standards. Precision machines and measuring equipments do not produce Quality Gauges unless handled by competent and dedicated manpower. Our employees in unison are striving to achieve Zero Defect and Total customer satisfaction. Our most important achievement is, our satisfied customers, which are spread across the globe. This journey would have not been possible and meaningful, without the support, confidence and trust of our customers. The SUTF 'KALIBR' is a designer and manufacturer of gauges and complex gauges (all rights reserved with the useful model patent) for effective controlling characteristics of thread and closure elements of tubes and muff of connection oil and gas gauge thread connection of Premium connection). Our line of premium connection gauges have been designed to inspect critical features of proprietary or premium threaded connections. 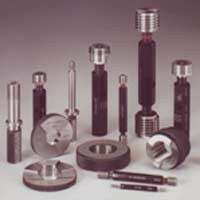 The gauges designed for these connections, like our specialty gauges, have application to many different styles of threaded connections. The factory is going to establish the first laboratory of API (American Petroleum Institute) gauges and production under the API Q1 system able of labeling the API monogram on gauges certification in Russia and among the CIS countries and also holds a full suite of API licenses for specifications 5B, 7-2 and 11B to offer a comprehensive manufacture and calibration service where certification to a master gauge is required.